thank you for your feedback - it means a lot to me. Speaking of feedback - on DakkaDakka it was pointed out that the weapon was probably too long and the shaft too thin. But the new weapon has a bigger and heavier blade, so I cut the shaft shorter. and started with the arm and shoulder armor. Then I added ornaments to the shaft, making it thicker at the same time. obviously the lower part got the ornaments too. Another armor section for the upper arm. While the shoulder armor cured I added a new seam to the coat on the finished side. Then the final shoulder section. So this is as far as I got. as previously noted I'm in process of moving. The house is coming along nicely with most of the renovation already done. Our target date for the move is still the 16th of December. So most of my man-cave is already packed. The "Executioner" diorama is also packed and awaits unpacking and re-evaluation on how to finish it. But I need some time away from it to determine if there's still anything to do or if I call it done. With everything packed away I thought I wouldn't do any hobby work until the move. I started some computer games, but none really captivated me. By sheer luck I came across a second hand Boudicca bust. Many of you have already seen this wonderful sculpt by Pedro Frenández. It is available at FeR Miniatures. 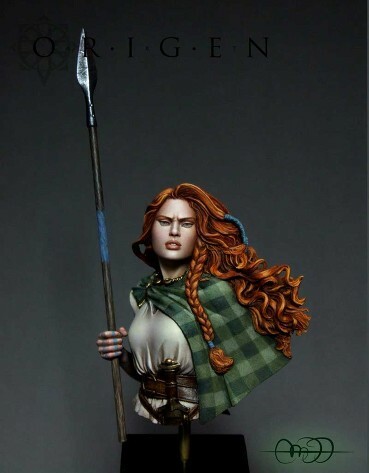 Most Boudicca's I have seen so far follow the traditional paint scheme of a red haired woman. 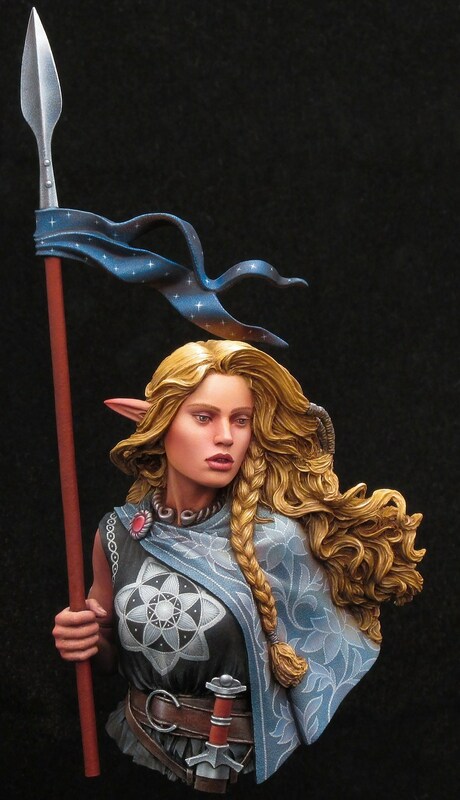 There aren't many modifications I have seen so far, except for this really nice Elf version. The bust I came across was dirt-cheap, and when it arrived I realized why. It was in bad shape with many small pieces of the hair and braids broken off. There was also a considerable amount of some kind of plaster in some of the deeper recesses. Apparently the original owner tried to make a mold, was VERY unsuccessful and decided to sell it and cut his losses. I'm not very upset, as the price already suggested there was something wrong. However, in the state she was in I'm unable to make a "standard" Boudicca. Unfortunately I forgot to take an image of her initial condition. Here you can see her after I shaved most of front tunic and belt off. In addition you can see some of the pencil marks of what I plan. She will wear some heavy leather armor for the chest and arms, with lighter leather mesh underneath. Most likely in a very dark red. First she got some longer eye lashes, a gem on her forehead as well as some neck/throat armor. On her chest I also added some structured material - not really chain mail, but similar. I used the same structure for her arm. In addition her main braid got a new ornament as well as the gem on her forehead. But for the time being, I glued her to a metal lid. Here you can see additional details on her chest line as well as the leather mesh for her lower abdomen. The lower part of the arm also got the mesh structure. The following day I started with the lower section of the leather armor. With some first details at the seams and the hip armor. The next evening I added the actual beast armor - as you can see I'm aiming for a worn and battered look with marks and scratches. With the cure time for the GreenStuff of several hours I can only do a small section per evening. So the next evening I completed most of the chest armor. Then I closed the last gap on the front with a gem and ornament and mounted her arm. And I started to sculpt her leather armor for the upper arm. I'm quite pleased with her appearance so far.